George Clooney, WAIT! Don’t Get Married! I Have Scientific Research Why! George Clooney STOP everything! Have you been thinking of getting married? Have you discussed this with your dad? Your mom? Have you consulted with Us Weekly? Well if you haven’t you might think twice about popping the question after you read this User Request Documentation Under Magazine Business (or officially known as: U.R.DUMB). Voting for the president? President schmesident! 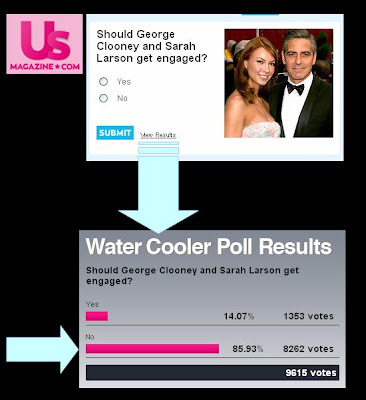 People really want to vote on whether or not you should be getting married to Sarah Larson. And the results are in. America has voted. And the results……will be revealed after this commercial break. We’re back. The votes are in. After thousands of useless Americans voted…I’m sorry George. You should not be getting married to Sarah Larson. Now, if you could sing us out, that would be great.